Scarborough Faire: A Weekend of Pageantry, Celebration and a Whole Lot of Fun! 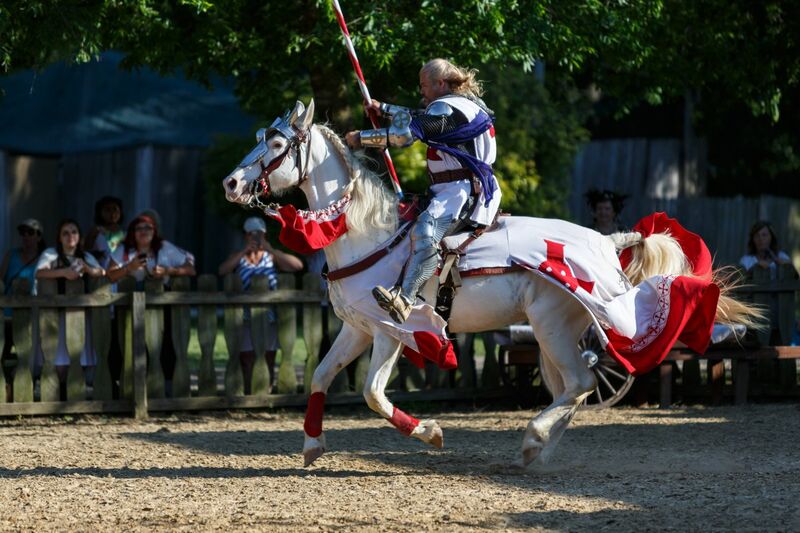 Scarborough Renaissance Festival begins its 39th season on April 6, 2019 with a variety of exciting new shows, extraordinary new artisans and an enhanced sense of celebration and pageantry. There are new shows featuring jugglers, acrobats, comedians, Irish music, escape artists, a Fairy Court, Renaissance combat competitions, a Scottish Knighting ceremony and even a dragon slayer! New Artisans include offerings of pottery, brass rubbings, pet treats & accessories, hearth & home products, leather works, Renaissance & Steampunk costumes and even a larger than life-sized Grand Labyrinth game! It will be full of pageantry, celebration and a whole lot of fun! Scarborough Renaissance Festival® is interactive fun for everyone, 16th Century Style that will run every Saturday & Sunday (and Memorial Day Monday) for eight consecutive weekends April 6 through May 27, 2019. 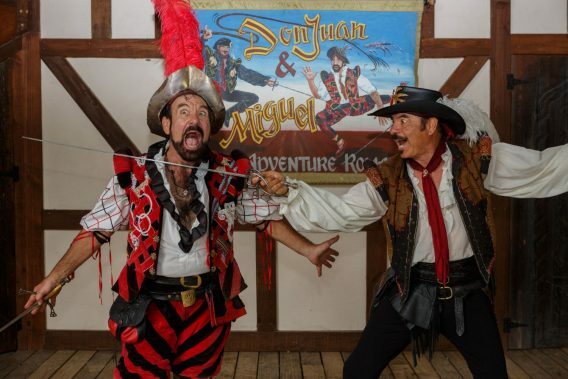 Visitors will enjoy full combat armored jousting, Birds of Prey exhibitions, the Mermaid Lagoon, Renaissance Combat competitions, Knighting ceremonies, a 150+ member performing company and 25+ stages of interactive and unique entertainment. You will also discover exquisite one-of-a-kind treasures at the 200+ shoppes and amazing artisan demonstrations along with Renaissance rides, games of skill and so much more. Each weekend also has a variety of special events. Scarborough Renaissance Festival offers “Food Fit for a King” that is a step above the traditional “festival food”. You and your family can feast on our famous giant roasted turkey legs (over 20 tons are consumed each season), Scottish Eggs, the largest food-on-a-stick selection in Texas, or try some of the daily special creations at our very own Pasta Palace and Scarborough Bakery. Our full-service restaurant & bar, the Rose & Crown Inn, offers a full-service dining experience with daily specials and signature items like Shepherd’s Pie, Bangers & Mash, meat pies and Muffulettas. Visitors 21 and over can partake in our custom blended Scarborough Mead, beer, wine and other adult beverages at one of the 12 pubs and taverns. 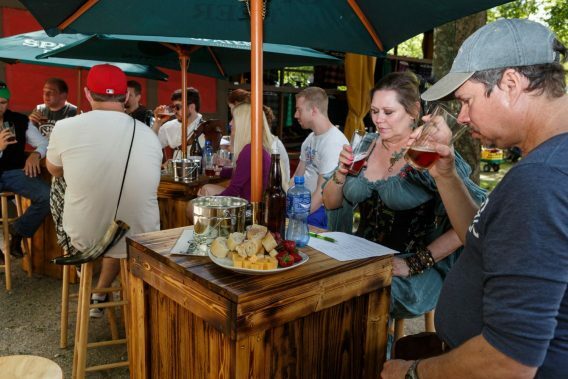 For those with a more discerning palate, there are also daily wine and beer tasting events. Tastings require a separate ticket that can be purchased in advance at SRFestival.com or at the Festival (on festival days). 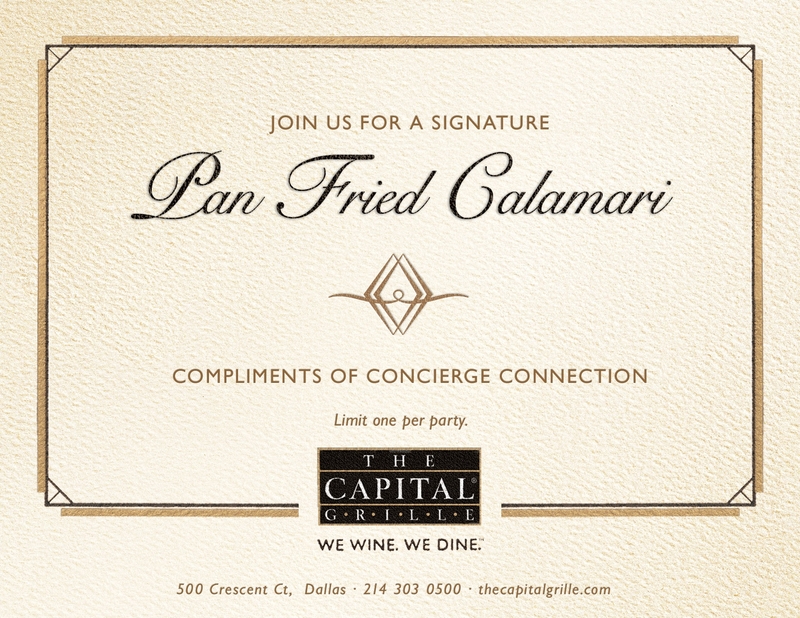 Seating is limited and the tasting events regularly sell out, so it is recommended that you purchase your tickets in advance. Captain Sir Francis Drake – A privateer and patriot home on leave who will raise glasses, melt lasses and leave knees weak in his wake! Raise a glass to the Pink Party, The Stoneleigh Hotel’s ode to an outdoor garden soiree where guests can paint and sip, play and rosé all day. Dress in your garden party best – pink preferred, of course! – for little luxuries and social pampering. 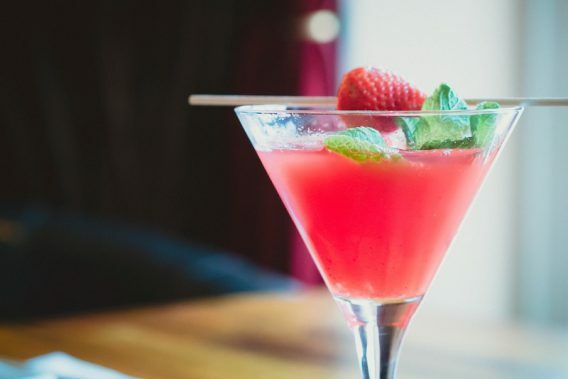 Starring rosé and frosé wines and signature cocktails, the premiere installment of the Pink Party will feature a Paint and Sip station, Kate Weiser Chocolates pop-up, delicious bites from Executive Chef Wade Burch of Perle on Maple, and a live DJ, among other surprises. The Pink Party will be held on Saturday, March 30, 11 AM to 4 PM, in the courtyard of The Stoneleigh (2927 Maple Avenue, Dallas, TX 75201). Stay and play all day and all night with the Pink Party Room Package including access for two to the Pink Party on March 30, one-night stay, and an enchanting breakfast for two at Perle on Maple. Use promo code “PINK” when reserving. Reservations and pricing are available online at www.lemeridiendallasstoneleigh.com and by calling (214) 871- 7111. Le Méridien Dallas, The Stoneleigh, is a historic luxury boutique hotel offering 176 guest rooms (including 73 suites), nine meeting spaces, restaurant and bar, outdoor pool, numerous amenities, and impeccable service. Located in the vibrant Uptown neighborhood of Dallas (2927 Maple Avenue, Dallas, TX 75201), The Stoneleigh is just minutes from the Arts District, downtown Dallas, Kay Bailey Hutchison Convention Center, and Dallas Love Field Airport. For more information, visit www.lemeridiendallasstoneleigh.com. Easter eggs, bunny butts and lots of fun! 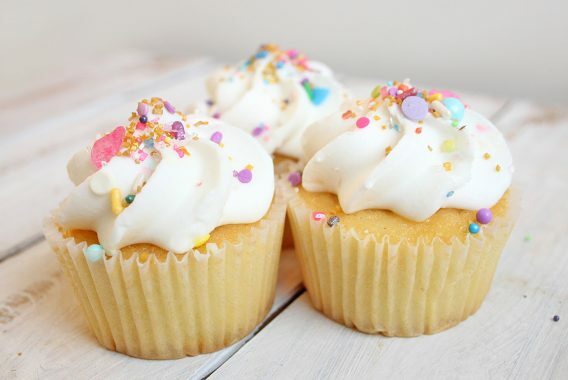 Join the fun and learn how to ice and decorate cupcakes like a pro at this Sweet Queens class. 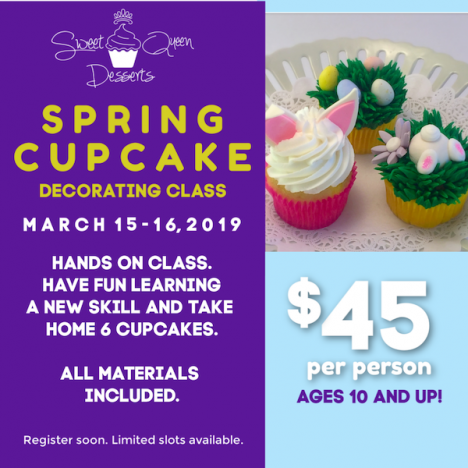 This hands-on class will teach you how to properly ice, decorate, store, and package beautiful cupcakes. Music Hall at Fair Park. 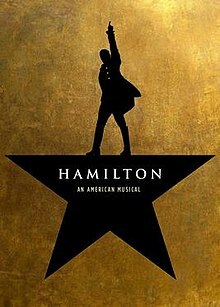 *Please note that Dallas Summer Musicals/Ticketmaster is the ONLY authorized source for Hamilton tickets in Dallas. If you purchase tickets from any other source, you run the risk of overpaying or purchasing fraudulent tickets.